Will Nokia 9 PureView be the best Nokia smartphone ever? We have already had an opportunity to see the new patent desing by Nokia with a total of 5 cameras on the back. Today 91mobiles have released a new render which gives us an even better view on the key design details of the upcoming smartphone. Next to 5 camera sensors that all use Zeiss optics, there is an LED flash as well as an auto focus module. This unique back camera setup will be in the form of a hexagon, and this 5 camera setup may even make the Nokia 9 PureView one of the best smartphones on the market. When it comes to the front of the device, we can notice that top and bottom bezels are both quite thick, which is nowadays rarely visible on other manufacturers' devices. However, we believe that the star of this phone will exactly be the 5 camera setup, so the front of this phone may not even be that important at all. 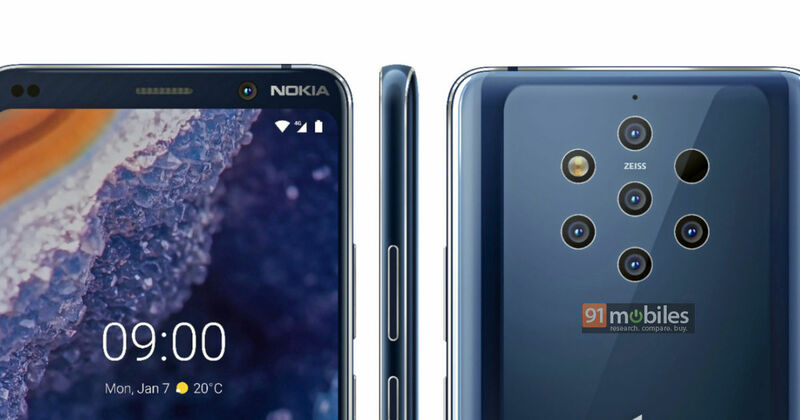 Nokia 9 PureView will have curved body on the back so users can handle the device more easily. Volume rockers will be aligned down the right side. Nokia 9 PureView comes with a 5.99" AMOLED display with the resolution of 2880 x 1440 pixels and aspect ratio of 18:9. This phone is believed to be powered by a Snapdragon 845 chipset paired with 8GB of RAM and either 128GB of 256GB of internal storage memory. This phone autonomy will be secured by a 4150 mAh battery that comes with an 18W fast charger. This device will also have an in-display fingerprint scanner, but it won't be equipped with a 3.5mm audio port. The USB Type-C port is still here and the phone uses it for charging and data transfer. 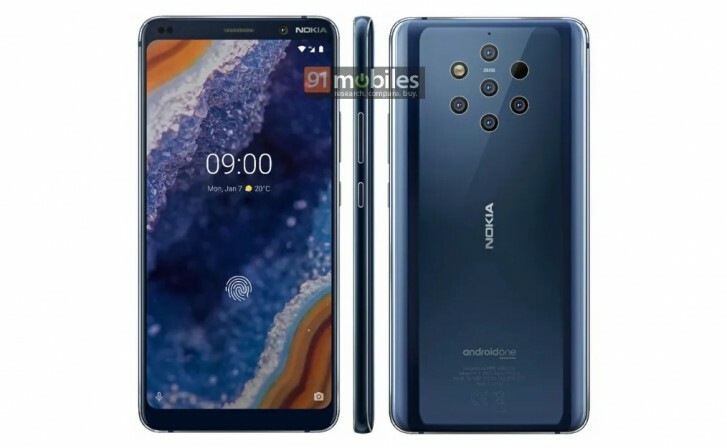 Nokia 9 PureView will work on Android 9.0 OS and it will be part of Google's Android One program. 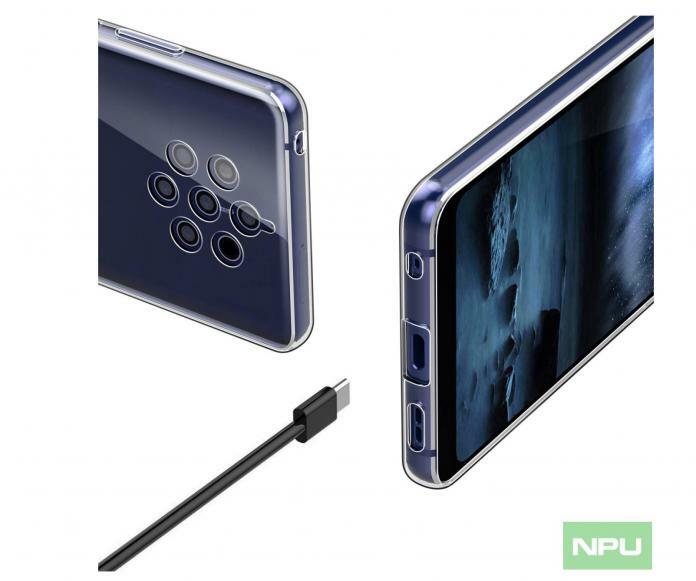 Nokia 9 PureView will be introduced on February 24, only four days after Samsung releases their leading flagships for 2019. Whether this phone will return Nokia to their former glory we still can't tell, but it definitely has the potential of being the best phone Nokia has ever made.